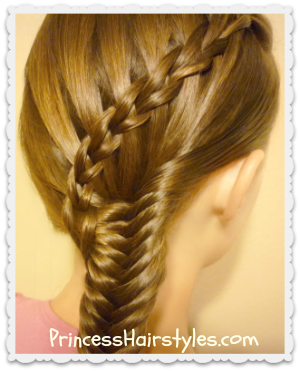 Our tutorial today is showcasing another hairstyle idea featuring the "waterfall scissor braid." If you did not see our video last week, we did a variation of this scissor braid (using rope braids) which ended up as a pretty "tie back waterfall hairstyle" linked here: Waterfall scissor twist braid. As mentioned last week, we originally saw this new braid on the wonderful "Viriyuemoon's" Spanish YouTube channel and loved it so much, that we just had to sneak in one more style utilizing the braid this week! There are so many different styles and variations that could be made using this braid, we had a hard time deciding what we wanted to do for this tutorial. 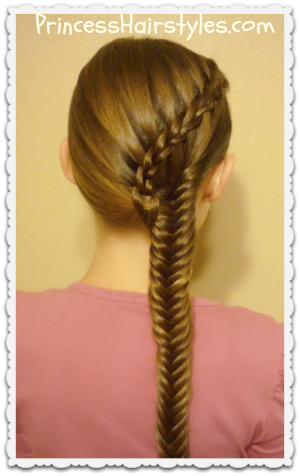 We finally settled on a simple side fishtail with the scissor braid diagonally curving over the top. Depending on the look you are going for, of course you can make your fishtail braid more messy, full, and deconstructed looking... or leave it as is for more of a sleek looking plait. 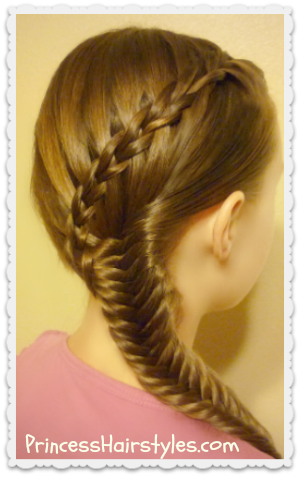 Scissor Waterfall Braid and Fishtail Hairstyle Video Tutorial: Click here to watch the tutorial directly on YouTube.